Through the Looking Glass: PD in your holidays? You must be mad! Last week some of my collegues were in New York, Mexico, Thailand, Gold Coast, Melbourne and Queenstown. That sounds nice. I was in Hastings, NZ. Perhaps not one of the more glamorous holiday destinations. 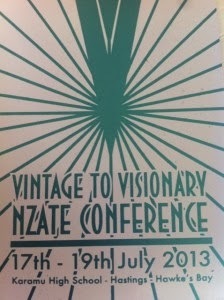 Along with my husband and half a plane load of English teachers, I flew into Napier, caught the Airport shuttle and prepared myself to enjoy the excitement of the Hawkes Bay and the annual NZATE conference, this year held at Karamau High School. I have never visited Napier or Hastings and to be honest, anyone who knows me will agree that Geography and basic directions are not one of my strengths. Thank goodness for Google Maps. However, on a cold and frosty Tuesday morning I was picked up along with three other English Teachers and headed to Karamau High School. From the Jazz band welcoming us, the vintage cars, to the organizing committee clad in 1930′s style, to the opening Keynote speaker, this was a fantastic conference. The food was amazing, the keynotes thought- provoking , the knowledge shared by colleagues from around the country was thoroughly professional and it was wonderful to meet up with old friends and make new ones. In this era of fast food, Facebook, reality TV and thirty second sound bites, it was soul food in the form of passionate educators sharing and inspiring us through the three days. It was also energising to discuss literature, poetry, Shakespeare, writing, reading, language etc with like-minded educators. One of the keynote speakers, Joseph Dreissen made me really think about the role of language in children’s lives, as well as the influence and importance of English Teachers. Thank you Joseph for making me feel valued and inspiring me to be a better teacher.